Kratie is the well known province in Cambodia with the Irrawaddy dolphin. The province has its center town is the same name. It is the quiet town but ideal destination for eco tourism. Kratie Province is located in the east of Cambodia. It is considered the connection between the North to the South of the country. The province is bordered with Stung Treng to the north, with Mondulkiri to the east, with Kampong Thom to the west and with Vietnam to the south. Districts: The main town is Kratie and there are 5 districts in this province. The districts are Chhloung District, Kracheh District, Preaek Prasab District, Sambour District and Snoul District. Climate: Kratie is the same with other provinces in Cambodia. It is in the tropical climate with warmness and humidity. The rain time in this area is from May to October. The dry time is from November to April. The average temperature is 27 C degree. It is good for travelling in this city throughout the year. Transportation: Travel conveniently by land, river way and airline to the city and from it to other provinces. Chruoy Rey: the historical site of Kratie. The place is located in Kantring Village. It is the favorite place for tourists who love to explore the history of Chruoy Rey and a part of Kratie. There are some famous historical buildings in this area. Dolphin Habitat: one of the famous destinations of Kratie about the wildlife of the dolphin. The place is located in Kampee Village. It is far from Kratie Town’s center more than 10 km. 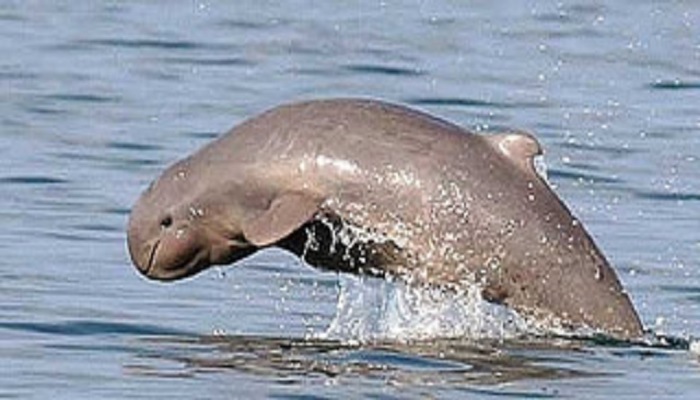 Irrawaddy Dolphins: Kratie is considered the home of rare freshwater dolphins named the Irrawaddy dolphin. So if you come to Kratie, do not miss a boat trip organized by local people to see how the rare dolphins act. It is fascinating trip for all people. Kampi Picnic Resort: one of the very famous resorts in Kratie. It is the place where tourists come to stay then swimming and enjoy the activities here related to the dolphin’s tours. The resort is located far from the town center more than 10 km to the north. Koh Pdao: the famous island where have the freshwater dolphins live. The island is located to the northeast of the country. And it is far from Kratie town more than 40 km. Sambor Town: The quiet town in Kratie with the great landscape and the long history. The town is located in the road to Stung Treng but in the left. This is one of the fascinated destination that you do not want to dismiss. The 100 column Pagoda: the famous pagoda with unique architecture. It is located in Sambor Town. The pagoda is located far from the town center more than 30 km to the north. Cham Pey Waterfall: the waterfall is in the area of the famous resort named Rut Cham Pey. It is located in far from Kratie center more than 30 km. This is the ideal place for exploring natural landscapes, some historical sites and enjoying the fresh air in the pure space. Independence Day: the event is happened in 09 November each year in Kratie and all provinces in Cambodia. Victory Day: the event is happened in 08 January each year in Kratie and all provinces in Cambodia. .
Khmer New Year: it is happened from 13 April to 16 April in Kratie and all provinces in Cambodia. Mekong River Festival: the first festival was happened in the middle of March 2015. It is planned to be hold in the next years in Kratie in the middle of March each year also. And there are many other unique festivals and events in the city. There are different local specialties in the province such as bamboo sticky rice, seafood, Khmer cakes, and other typical specialties.